The big red mare had a pleasant attitude, this was greatly appreciated as in her current condition a lot of other horses may have been more difficult to handle. She was suffering from an acute allergic reaction; her body covered from end to end in large protruding welts. The veterinarian was busily poking around, looking her over and trying to deduce what may be the source of the mare’s alarming appearance. The doc speaks periodically in rapid Italian to trainer Stephanie Durand. I try to decipher as much as I can, my Italian being only as proficient as my latest classroom dialog. It’s a cold winter day, a light snow is falling; the tiny flakes melting as soon as they touch the mare’s bumpy warm coat. I’m a part of the scene but my lack of language ability keeps me on the fringe of the action; relegated to observer but I also happen to own this mare. 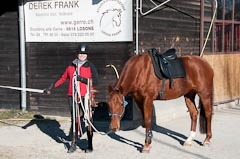 It’s been over a year since my husband Art and I moved to Europe from the U.S. I’ve been riding the school horses here at Scuderia alle Gerre since the fall of 2009. After a lot of soul searching, I had decided to look for a horse of my own. Just my luck, I find a terrific horse, my first new saddle horse in ten years and first-rattle-out-of-the-box we have a string of vet bills; typical! I’d bought this mare a few weeks before. We met one day when I’d gone out for a lesson with my instructor Derek Frank. He was riding her- a beautiful chestnut Oldenburg. Derek hadn’t owned her very long himself and he was hoping to resell her as a show horse. I liked her immediately; “She is called Gracia”, Derek explained. ‘Gracia’ in Italian, translates to English as Grace. She was a good looking mare, she moved like velvet, had a successful show career behind her and a great disposition. 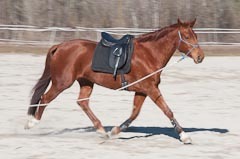 I had been diligently searching for a Quarter Horse gelding, not too tall, with a background in stock work. This mare was pretty much as opposite to those criteria as she could get. A German Warm Blood, over sixteen hands tall, with a background in high class show jumping. She also had the welts all over her at the time but I wasn’t too concerned as I had seen this sort of thing before. 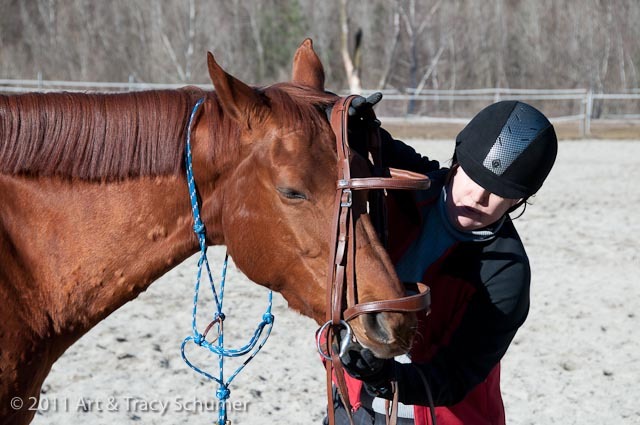 Moving a horse to a new barn is a common trigger for these types of ‘flash’ reactions. A cortisone injection would clear up the problem and it did but in this case the cure was temporary. So I will happily take the blame for getting excited and buying a horse covered in allergic hives. The vet continues his examination by doing some acupressure tests for sensitivity. 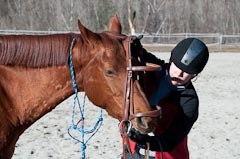 He finds some stiffness in the mare’s right shoulder but not much else. Her body temperature was also normal. She’s fine, but he recommends we put her on a “cleansing diet” and a series of small subdural injections designed to help desensitize her. All of this is coming at me in speedy Italian. When the vet starts describing what to feed Gracia, I hear the word ‘riso’, which means rice. I must say, I have never heard of feeding rice to a horse but folks over here have been taking care of horses for thousands of years so I decide to keep an open mind. With the exam complete and the doc’s prescription dutifully taken down, Stephanie turns to me to explain everything in English, “now you must go home and cook rice.” Not just rice, it turns out Gracia needs a lot of rice! My highly supportive husband Art was left scratching his head; looking on as I proceeded to employ every cooking vessel available in our tiny apartment kitchen. I cooked up five kilos, or 11 pounds of rice, cooled it all down, packaged it up and hauled it back over to the barn in the back of the car. Gracia or Gracie as I now call her, munched through the first load in about four days. She will need to keep this up for about ten days, so by the time this little project is finished, I’ll be a expert rice chef! I will add updates to this story as it develops but so far so good. The rice diet and injections appear to be having a positive effect. Gracie’s hives are subsiding and she seems to be perking up and feeling better. I had her on the long line yesterday and when I asked this big girl for the canter, she showed just how much horse she could be! I had my hands full, I now have a better idea of how tough it actually was for Pat Parelli in Portugal last November; he really did a great job. Achieving a true state of grace with my new friend will take time but I can’t think of many other things I’d rather be doing!